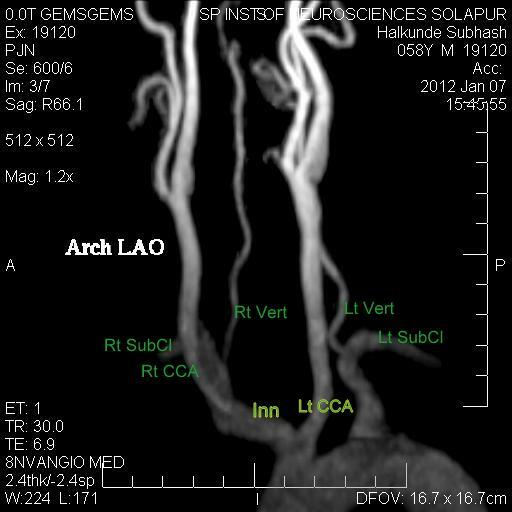 Left CCA has a common origin with Innominate artery instead of arising directly from arch of aorta, a normal anatomical variation. The term “bovine arch” is widely used to describe a common anatomic variant of the human aortic arch pattern, is a one of the most widely used misnomers and has no resemblance to the bovine aortic arch found in cattle. The most common and normal aortic arch pattern in human consists of 3 major vessels originating from the arch of the aorta. The 1st branch is the innominate artery, which gives right subclavian and right CCA. The 2nd branch is left CCA, 3rd and last branch is left subclavian artery. The second most common pattern is left CCA has a common origin with the Innominate artery, instead of arising directly from the aortic arch - "Common Origin of the Innominate Artery and Left Common Carotid Artery". Similar but less common variant is the left common carotid artery originates from the innominate artery rather than as a common trunk - "Origin of the Left Common Carotid Artery from the Innominate Artery". 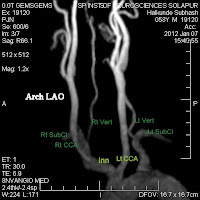 Both these variants of left CCA origin have been called as a “bovine-type arch" in various textbooks and articles. The actual Bovine Arch pattern is different and has no resemblance to any of the above described human aortic arch patterns. A single great vessel originates from the aortic arch which gives two subclavians for either side and a bicarotid trunk. The bicarotid trunk then divides into the left and right CCA. So the term “bovine aortic arch” is a misnomer, instead of that we can just descriptively mention the finding of the aortic arch variant as "Common Origin of the Innominate Artery and Left Common Carotid Artery" or as "Origin of the Left Common Carotid Artery from the Innominate Artery" which is going to be more accurate and specific. Anyway it’s a normal anatomical variation. Clinical significance may lie during DSA, as in this variety of arch, engagement of left CCA done using Vitek or Simmons 2 Catheter which provides necessary back up needed to advance guide wire.